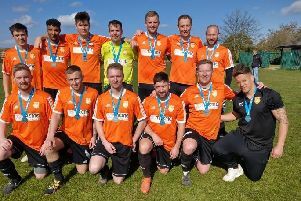 Ketton’s 14-match unbeaten run in the ChromaSport & Trophies Peterborough League Premier Division came to an end at The Grange last night (March 9). They were beaten 2-0 by Netherton United, who got off to a lightning starty with a goal by Jezz Goldson-Williams after 15 seconds. The former Deeping Rangers and Bourne Town striker latched onto a throughball and finished into the top corner with a left-foot volley. Netherton added their second after half-an-hour through Ben Cullen. Netherton have moved up to fifth in the table - a point behind Ketton.